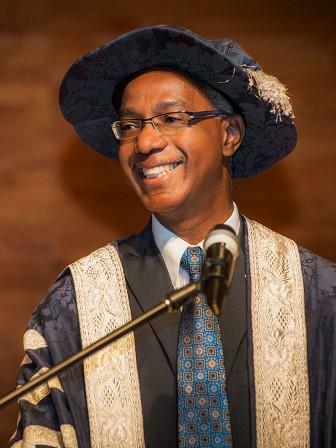 BRANDON, MB – With “I do so promise”, Dr. Gervan Albert Fearon was installed as the 15th President of Brandon University (BU) before a crowd including students, staff, provincial and federal politicians, Aboriginal leaders, and academics and University administrators from across Canada. University Chancellor Michael Decter introduced Dr. Fearon as someone “who can move people in the direction of positive and constructive change”, a theme repeated by the province’s Minister of Education and Advanced Learning. “You are the instigator of a renaissance at this University that will flow through the city and the region,” said James Allum. Dr. Fearon first joined BU in 2013 as Vice-President (Academic and Provost), becoming President in August, 2014, following an exhaustive cross-Canada search. Dr. Fearon holds a Ph.D. in Economics from the University of Western Ontario, and degrees in Agricultural Economics from the University of Guelph. He served as a Dean at Ryerson University in Toronto, Associate Dean at York University, Senior Analyst at the Ontario Ministry of Finance (Treasury Board), and Executive Assistant to the Deputy Minister at the Ontario Ministry of Agriculture, Food and Rural Affairs. A well-published scholar, he is also the recipient of awards for teaching excellence and the Queen Elizabeth II Diamond Jubilee Medal. Dr. Fearon has been appointed to a five year term as President, ending July 31, 2019.